June 27th: Englund posted a blog entry addressed to President Hu Jintao inviting him and anyone else to form a “freeze flash mob” in Pudong on July 1st (the Communist Party’s birthday) where everyone would freeze in place for five minutes. 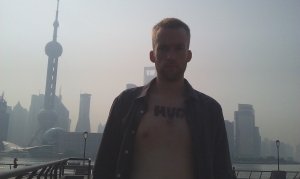 Inspired by Ai Wei Wei, he suggested Hu write “Freedom” somewhere on his body. The gathering would be an attempt to protest for freedom in China. Englund posted it on his twitter for some Chinese friends. June 30th – In a class, Englund’s Chinese teacher arrived late and later mentioned the blog entry, asking him to delete it. Englund then found out that she was late because she was being put up to talking to him by a Communist Party leader at the school. Englund talked with the teacher for several minutes saying that he’d be happy to talk with the leader directly, but didn’t intend to take down the post. Later that afternoon Englund got a call from the teacher saying that the leader wanted to meet him for coffee and a talk. Englund asked to delay the meeting until the following day. He later found that his blog could no longer be accessed, so he started a new one. He copied the original contents onto it and spread word of what was happening to his growing list of twitter followers. July 1st – A woman and two men came to his apartment in the morning saying they had some kind of bill for Englund. He was skeptical about who they really were since they could have just put the bill in his mail slot. Later that morning he left to go to the gym but saw two men (his blog says two men, twitter says only one) by his elevator that popped up with interest upon seeing him. They followed him in the elevator. When they got down, Englund stayed in, as did the men. They went back up. Englund got his phone from the apartment, tweeted and then went back down again…with the men. When he got down a third man was waiting with a police car and said they would be going to the university (no time for the gym). Englund asked to go to his apartment again to get something. Inside he tweeted and emailed his embassy. He also put on a hidden voice recorder and started recording. He heard a knock on his door. The men and the teacher were there. They continued to question Englund. He assumed it was to keep an eye on him and prevent him from making further blog entries or going to the bund. They asked for the password to his blog account to which he refused, saying it was against his human rights. This was the only question he refused to answer. The police yelled and threatened him at several points, saying that he could be sent home and that he legally had to answer every question. Englund eventually had to sign and fingerprint the six pages of his answers that the police had written down. They refused to give him a copy. They said they would keep his passport until the following Monday and decide what to do. Until then, he should be careful. The whole ordeal lasted 9-10 hours. Englund started to worry he might be arrested. He then discovered his voice recorder had been running the whole time. July 4th (Monday) – Englund was supposed to receive his passport. He was told it wouldn’t be ready until Thursday. July 5th – Englund still uses twitter to call on people to go to the bund with “Freedom” written on them. His followers increase by about 400 people. July 7th – No word on the passport so Englund goes to the Fudan office where it’s being held. He’s told they will have a meeting the following morning. July 8th – Englund gets his passport back with his residence permit stamped with “Length of stay shortened.” He now must leave by July 10th. I did my best to make sense of all Englund’s writings through Google translate, but keep in mind, I’m not a Swedish speaker and I’m a haphazard Chinese speaker. So if there are any errors, this is my disclaimer. But I think it’s true to Englund’s words. That sent a chill through my spine. Like probably most bloggers in China who write on politics, expulsion is something I constantly worry about. People have been sent to labor camps for writing much less serious things than some of what I’ve written. I know as a foreigner that would never happen to me, but deportation is a definite possibility. When I got a little deeper into the story though, I relaxed a bit. The guy seems to really support the cause of freedom, but he also didn’t seem to have much to lose. He must have known that organizing a peaceful protest wouldn’t be taken lightly, but it almost certainly wouldn’t result in jail time for a foreigner either. According to the Global Sources article, he was planning to leave China on July 27th anyways, so the expulsion really only cut his stay by about two weeks…and he still had time to finish his tests while his passport was being held. It also seems that he was given several opportunities to save his hide after the blog was discovered, but he remained antagonistic to the end. I seriously doubt his fate would ever be shared by a mere English-language blogger like me (my visa was just extended yesterday for another year by the way). This guy was pretty much asking for it, so I’m not at all surprised this happened; especially being on the Communist Party’s huge pat-themselves-on-the-back anniversary. Still…it’s another sign of a paranoid party making an international embarrassment out of a situation that would have otherwise amounted to absolutely nothing; save a handful of people standing still on the bund for five minutes confusing onlookers. Deporting Englund when he was going to leave in two weeks anyways was just the cherry on top. Now it could even turn into a copy-cat movement emboldening sympathizers to stage similar protests to mock the party. So is the government really that stupid? Or could they be trying to send a message to other potential foreign troublemakers? Who knows? Both scenarios have ample precedent, but I would guess the former. It seems like it was just local officials at Fudan University responsible who were probably just playing it safe from their perspective. Englund is on a plane back to Sweden right now as I write this so there will undoubtedly be more that comes out when he lands. Hopefully that includes the recording of his interrogation and explanation of just what the hell he expected would happen. [UPDATE 7/11] Mr. Englund is back in Sweden now and seems to be enjoying his 15 minutes of fame and doing a lot of interviews, which he has been advertising on his Twitter feed. Here’s a video from a Taiwan news agency called New Tang Dynasty Television that gives some more up to date info (with English subtitles) and comment from a very supportive Chinese dissident. All blame should be put on this guy for being an absolute fool. There will be a time, someday, when China is willing to be more open minded about these kinds of things. That said, the day is not today nor will it be within the next many years. He was dealt with in the same way that they would a normal Chinese citizen, and he shouldn’t expect any more. He is lucky he wasn’t thrown in Jail. 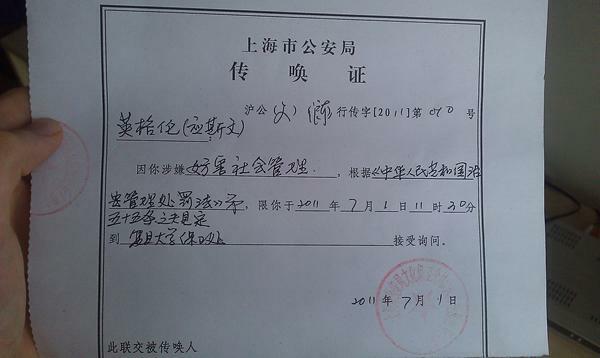 He has jeopardized his studies and his future involvement in China, as I doubt they will let him back into the country. I’m in two minds about this. I don’t at all oppose what this guy was doing – all Englund was doing was exercising free speech. I also don’t at all approve of the actions of the authorities. However, there is something which makes me a little uncomfortable about a foreigner calling for a flash mob in this fashion. Suppose it had gone ahead? As you point out, Englund, really, was never in much danger – but any local people who had been involved might have been. The thing i really don’t get, though, is why the authorities cared at all. Englund put these posts on Twitter for Christ’s sake, which is blocked – would that many people even have read it? Same goes for his blog. PS – Similarly to the Epoch Times, NTDTV is a Fa Lun Gong outlet directed at mainland Chinese, ex-mainlanders, and FLG followers around the world. It’s not really a Taiwanese news station like, say, Dongsen News. Just like Epoch Times reports, you really shouldn’t treat NTDTV reports as factual unless they can be corroborated with other sources, at least on certain subjects.